So you really want to make your own slide? Before I review the best and worst methods for making a slide and tell you the method I’ve used for my slides, let me try to dissuade you from even attempting to make a slide. Then, if you still want to continue, I’ll share what I’ve learned. Costs more than store bought. If you must purchase tools or supplies to make your slide it could easily cost you more than even the most expensive commercial slides. Do you want a genuine bottleneck slide in blue glass. You can buy one for under $20. (Try BigHeart single and double cut bottleneck slides). Wouldn’t you rather be playing guitar? 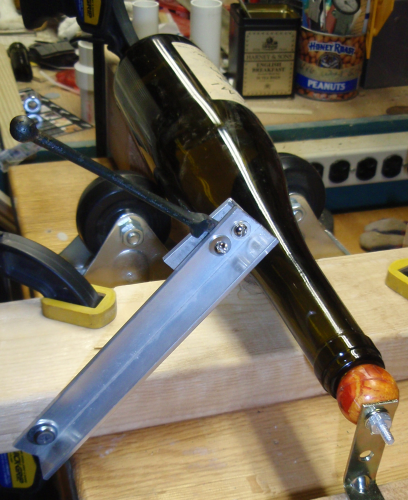 The wine bottle and your labor can be considered to be “free” but you will probably make some mistakes on your first slide and it does require some time to get to finished bottleneck you can use. Wouldn’t you rather be playing guitar than trying to make a slide? Making a slide can be dangerous. WARNING! You may experience sharp, broken glass which can cut you and cause severe bleeding. Some methods involve flames which could burn you (or catch your house on fire). Do you have a fire extinguisher handy and know how to use it? You may need to use power tools. Do you know how to use each tool safely? Do you have eye protection (safety glasses)? Do you have hand protection (leather gloves)? You may need hearing protection if you are using power tools. Not dissuaded? I’m not surprised. Neither was I. But I felt I had to try. My memories of making my first bottleneck slide are somewhat fuzzy. I seem to remember I tried once when I was still in high school. So, probably more than 45 years ago. I didn’t drink much wine back than (none if I recall) so I had to rely on my parents wine consumption. There was no internet back then so no easy source for searching for ways to make a bottleneck. Somewhere I found the description of the burning string method. My source was probably from a magazine article at the library. The essence of this method is you take a length of string that has been soaked in a flammable substance and wrap it around the bottleneck where you want to “cut” it. Light the string, let it burn out then dip the bottleneck in cold water. Crack! In theory, you have a cleanly cut off bottleneck. The reality was not so good. The bottleneck was indeed separated from the body of the bottle, but the break was an uneven with sharp points and of course razor sharp edges. The sharp edges are expected. You must sand, file or grind these to make them safe. But it wasn’t a clean even cut around the circumference of the neck. Ever since I’ve been on the lookout for better methods of making bottlenecks. No, I have not been on a continuous hunt for the method. It’s been an occasional obsession which flares up when I am unhappy with my current slides. One of the things to note before starting is you can find YouTube videos for each of these methods, but only one of these methods has YouTube videos that actually show the method being used to make a bottleneck, in spite of keywords and descriptions suggesting that the method can be used for this purpose. Here’s my review of the methods available for making a bottleneck slide with my comments. This is the method I’ve used for all my most recent slides. I started using this method over eight years ago after I purchased a National Style O and renewed my interest in slide guitar. The method requires you to essentially saw through the glass. Only you don’t use a saw but instead any tool that grinds the glass to produce a cut. You should grind around the entire circumference of the neck. Do not try to saw it from one end straight through to the other. I once tried a manual method that used a special “blade” that attaches to a hacksaw. It worked but I don’t recommend it. The best approach is to use any of several power tools with grinding attachments. The following video shows using a cutoff wheel on a Dremel rotary tool to cut a bottleneck. Note that this and the next video are the only ones I’ve found actually showing someone successfully making guitar slide. Another attachment that could be used on a rotary tool is a diamond engraver. Here’s a video of its use for making a bottleneck. The device I used is a Rotozip tool with an attachment for using a cutoff wheel. If I remember, the wheel I used is for ceramics such as ceramic tiles. You can see my Rotozip with cutoff attachment in the first image to this post. If you do not already own some type of rotary tool such as the Dremel (designed for hobbyists) or a Rotozip (designed for home construction projects) or equivalent, then a barrier to using this method is the cost of the power tool and accessories. But there is a less expensive alternative which I’ve tried. My less expensive alternative still requires a power tool. But the tool is power drill and it is more likely you own one or can borrow one. If you need to purchase one, you can probably buy one for much less money than any rotary tool. The other accessory you need is a cutoff wheel/grinder attachment designed to fit in the chuck of a power drill. This does not produce as fine a cut as the other rotary tool methods, but it does work and is less expensive if you need to purchase equipment. You can see the grinding wheel I purchased for my drill in the image at the beginning of this post. The remaining methods are NOT recommended (except maybe for the wet saw method listed at the end). But because you will come across them if you are searching for methods, I wanted to include them and my comments. Save yourself some effort, read here then use the above method or purchase a commercial slide. I’ve already described this method. Don’t try it. I’ve never been able to make a decent bottleneck slide with this method and I’ve never seen anyone else who has either. The main advantage of the method is the supplies required are inexpensive and you may already have them. This is outweighed by the fact you are highly unlikely to ever make a good slide using the method. 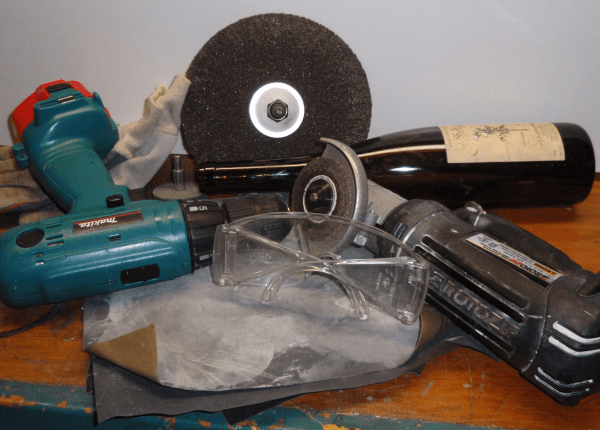 If you want to see this method being used to cut a wine bottle, here’s a video. Note, it does NOT show the method being used to make a bottleneck slide. You may want to turn off the sound – that’s my preference for the accompanying music. All you should require to break a glass cylinder such as glass tubing, or a bottle or a bottleneck, is a short single etch where you want the glass to “crack”. You then “encourage” the crack to expand until it has encircled the glass. That’s it. The glass “cracks” and separates. The first difficult part of this method is making the score. Glass makers probably use a carbide or diamond tipped pencil to make a mark on the glass. Back when I was a young scientist, in an age when open flames were still permitted in laboratories, I was taught how to break glass tubing. I probably learned this in basic chemistry class. You scored the glass where you wanted it to break. We used triangular files instead of a diamond point pencil. We encouraged the glass to crack by “snapping” it at the score. It mostly worked but it is harder to make a “straight” score than you might imagine. Or at least it was for me. If the score wasn’t perpendicular to the length of the tubing, you were unlikely to get a nice even break. The good news is we had Bunsen burners and could flame polish the ends and for small diameter tubing this hid uneven breaks. The cracking method of glass makers uses heat to encourage the break. The bottle is placed on a spinning platform (Lazy Susan) and kept spinning while a small flame is applied to the glass where you want it to crack. Eventually the crack will expand from where it was scored or etched and the two pieces separate cleanly. The second set of difficulties to this method when applied to making bottleneck slides has to do with the difference between glass bottles or glass tubing and bottlenecks. The walls of a glass bottle are relatively uniform around the circumference and compared to the bottleneck are quite thin. Take a look at a wine bottleneck. Preferably look at a bottleneck that has already been made into a slide because the top of the bottle will hide the things I want to describe. First, the glass thickness in the bottleneck is much thicker than in the body of the bottle. 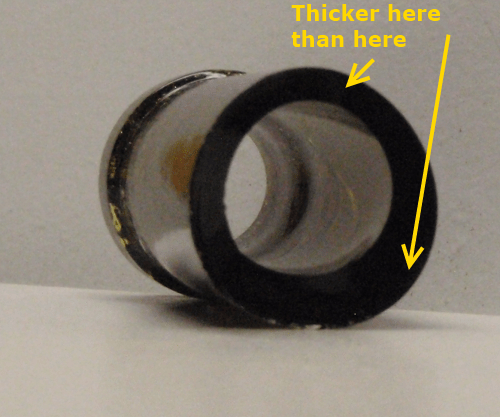 Second, it is quite common that the bottleneck thickness is not uniform. One side may be nearly as thin as the body while another section may be much thicker than the average thickness. The problem I believe the above two observations cause is encouraging an etched score in the neck to propagate will take a much longer time, if it can happen at all, and if it does happen, the uneven thickness makes it difficult for the crack to follow the path you want it to. Here are a couple of videos showing this method – on thin glass. The first gives some history of the method as well as a demo. The second shows the method on a bottle but not on a bottleneck. Note again, that I could find no videos of this method being used successfully to make a guitar slide. The glass cutter method, at it’s basics, starts by using the same approach you would use to cut a sheet of glass but applies it to a bottle. The first problem is the same as the for the previous method. Namely, it is difficult to produce a score that is perpendicular to the length of the bottle. An additional problem is that you need to score the entire circumference of the bottle with a line that meets up with the starting point. This is difficult if not impossible without a jig. You can purchase jigs just for this purpose. The jigs can cost from $20 to $50. Buying a glass slide is less expensive. Using the jigs can also be difficult based on reviews and videos I’ve seen. The problem is you must make a single even score around the bottleneck. Don’t go over an area twice because it is likely to be in a slightly different spot. Don’t have any skips – which can also be difficult to avoid. I have not purchased one of these jigs so I can’t comment on how they would work. But I did build my own jig and it failed about the same way the previous method failed. I believe the reasons are also the same, unevenly thick glass. I don’t recommend this method. Most of the videos I’ve found for this method are from people who want to sell you the jig they are using. None of them show the jig being used for guitar slides. Still, it is interesting to view. It would seem this has a better chance of succeeding than the previous method, but it has never worked for me. Note that this method uses hot and cold water instead of a flame to encourage the glass to break along the score. Be warned that the following video is preceded by an advertisement. I am not connected to the video or the ad. This method is unrated. I’ve never tried it and can find no good sources for someone who has successfully applied it to making bottleneck guitar slides. I suspect it is the best method if you have the right wet saw and blade. A wet saw is a power tool much like a table saw (although there are other designs). Instead of a standard steel cutting blade for wood it has various cut-off wheels designed for cutting different materials. There are wheels for granite, marble and ceramic tile. It is used for cutting tile or other materials for kitchen and bath walls, floors and counters. The wet part of the wet saw is there is a mechanism that allows the blade to be cooled by water. This is needed because cutting these materials causes a lot of friction and results in hot blades. You can also cut glass with a wet saw. The best blade for this is a diamond impregnated thin steel blade. These blades can cost from $25 to $75. If you don’t already own a wet saw, perhaps from a DIY remodeling project, then the first obstacle is you need to invest some money just to buy the saw. Renting or borrowing might make more sense. The second problem is some saws don’t allow the blade to be adjusted so that they can cut through the bottleneck while it is still attached to the bottle. For example, some saws I saw indicated in their specifications that the maximum cutting depth was one inch. I’ve measured some wine bottles, standard 750 mL size, and most need 1-1/4 inches or more from the table through the bottom of the neck. More expensive machines (either a different design or with a ten inch blade instead of a seven inch blade) can cut up to 2-1/2 inches deep or more. But those machines cost from about $500 to $1000. My conclusion is this is a good method if only you had the saw and blade. It is essentially an improvement on the grinder method I recommend. Improved because it cools the blade while cutting which can keep the glass from breaking prematurely due to excessive heat. The following video shows a wet saw being used to cut a glass bottle but not a bottleneck. Thin lapidary saw blades can be purchased for wet tile saws in any diameter and should povide the cleanest cut. All you need to do is come up with a jig for your particular saw. This video shows a $5 jig as long as you have a clamp and the use of hot water to create pressure and heat shock is excellent, though a bit nerve racking (due to pressure). I’d also like to point out how important it is to use water whenever sanding/cutting glass. It will 1. Prevent heat shock and 2. Act as a safeguard from inhalation. Inhaling glass dust causes a severe condition called silicosis- very dangerous stuff!